Well another year is almost over and it seems that time has passed so quickly! Hard to believe that it's almost 2019. We've been fortunate to have a good year, despite a record drought in the summer and unpredictable weather for the rest of the year. It's pretty much true that when you farm the most important things in life are health (yours, the family's and the animals') and the weather. The weather impacts everything. Too much or too little rain can ruin a year's worth of hay or grain for feed. High winds take off roofs and damage outbuildings, and deep freezes affect the body condition of pregnant girls. It's pretty challenging to adequately describe the stress that the weather can have on your neighbour farmer. A bad weather affects the price of everything we buy on the farm and in turn affects the price the consumer has to pay for our goods. The lucky farmers meet their customers face to face at a market or at the farm stand and can explain why their products cost what they do. I guess my message would be once again to try to buy local, support your local farmers and know that your purchase power makes a difference in their family's household economy. We had a great lambing year. I was able to sneakily keep back 7 lambs that show great promise in both fibre and confirmation. We didn't have any crias this year, but we have 5 girls bred for next year so follow us on Facebook for some great updates during the summer of 2019. Breeding of the sheep is almost finished and then the boys will go back to the boy paddock. It will be nice to have fewer areas to clean, supply water to and haul grain for. We'll have some purebred Romney and Icelandic lambs this year, plus some exciting crosses. We were so lucky to have Kelly reach out to become a volunteer. Kelly recently returned to Ontario from Alberta, leaving her sheep farm behind so she could come home to help with her parents. She's been such a welcome addition to our farm - not only can she help us with daily husbandry but she's been taking over some of our markets, which frees us to do more than one market at a time. We also had a summer intern this year. Nat is applying to vet college and wanted some large animal experience. She jumped right into toes, teeth and needles with intelligence and common sense, and a healthy dose of enthusiasm. We're hoping she returns next summer, and more so hope that once she becomes a vet she lands a job at our beloved Dunnville Veterinary Clinic so she can make regular visits. Our 100% wool blankets from MacAuslands Woolen MIll came in time for the summer markets. These are lovely blankets (no one does it better than them) and we have Queen and lap size in stock. December 1st we had our FIRST open house! It was an excellent adventure, despite the terrible weather. People came out to take photos with the critters (Monkey, Sarah and Mikey got their fill of grain! ), drink coffee and cider and so some holiday shopping. It was a family affair, and we were once again so grateful for the support of our families and Kelly! We have just finished our last market of the year (the wonderful Maker's Market at Christ's Church Cathedral in Hamilton) and so are happy to be fully unpacked. We will be open for Christmas shopping on the weekends until Christmas, and then will take a lovely break until the New Year. LandMade returns Feb. 3 at the Gladstone Hotel this year, which will kick off our market season. We wish you and your family Merry Christmas, Happy Hanukkah and all the joy and happiness of this festive season! All the best for a wonderful holiday and for 2019. 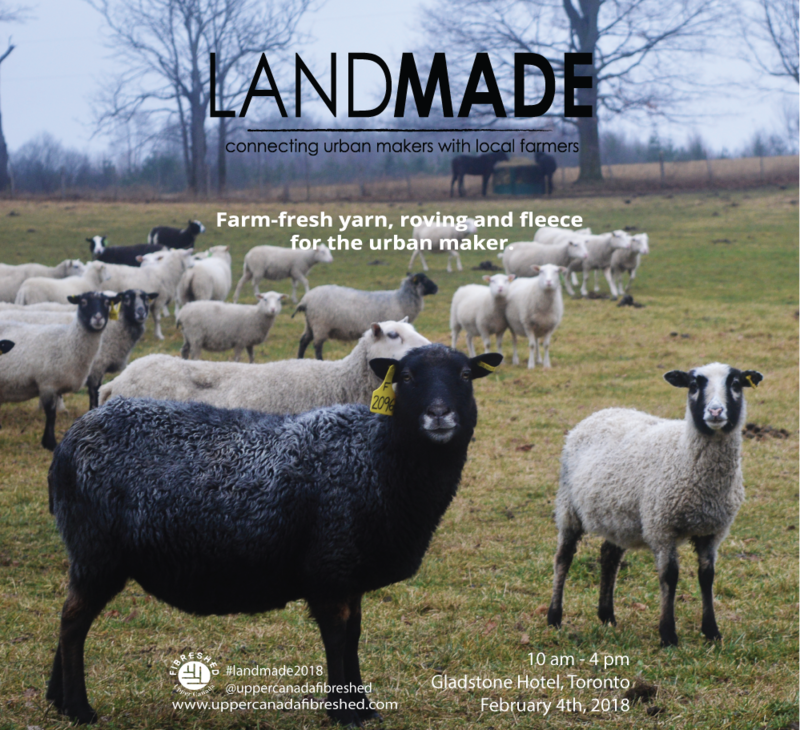 We are gearing up for another LandMade ... taking place at the Gladstone Hotel in Toronto on Feb. 4. We are proud to host this event, in conjunction with the Upper Canada Fibreshed, because we believe strongly that the urban fibre community should get the chance to meet the people that grow the fibre they use. The farms bring yarn, roving, batts, fleeces and pre-felt at “shop local” prices. There are a significant number of sheep breeds available- Romney, Icelandic, BFL, Corriedale, Lincoln Longwool, Rambouillet (in crosses), and Down breeds. Alpaca fibre is also available, obviously. There is an amazing and creative knit-in and spin-in on the stage, and plenty of places to sit and relax and pull out your knitting needles. It’s a creative and energetic day, where people who share a love of fibre come together to talk fleece and yarn and animals. The farmers want to meet their customers, to get the chance to share the love they have for their animals. And the urban makers get a chance to meet their farmers, and to support fibre farming in Ontario. If you can come down for it, it runs from 10-4, and it’s free. More about Landmade. We were thrilled at the number of creative, enthusiastic people that came throughout the day, who seemed eager to meet the farms. Guild members, novices, professionals, knitting club members, there was such an interesting cross-section of people coming through the doors. And it was impossible not to admire the hand-made sweaters and coats, hats and legwarmers. Even UCFS co-founder Becky's baby rocked a natural fibre look. At the end of the day, I think all the farms shared the same sense of gratitude at the support of so many. We were also blessed by the involvement of others - Bree Zorel spearheaded a super knit-in and had folks dropping in all day to knit (and shop.... Thanks Bree, for loving our grey Lopi). Spinners shared the stage and even taught Rob Scott (OSMA chair) the finer points of spinning. The stage was a creative hive all day, with guild members and strangers coming together to make and talk. We had tremendous support from the local guilds and from Woodstock Fleece Festival. The fact that they shared the news with their membership helped us get the word out. Nicole Klenk is also a great friend to wool farmers everywhere. Thanks also to the Ontario Handweavers and Spinners eblast for sharing, too. The support that family and friends gave via their own social media was also invaluable. The Upper Canada Fibreshed is run by an amazing group of dedicated women who work tireless to promote the environmental, social and economic benefits of sustainable fibre production. And The Peggy Sue Collection, Upper Canada Weaving and the Upper Canada Merchantile are all examples of putting belief into action. If you were there and would like to reach out to the farms, or missed it and would like to track them down, here is the list in order of Sunday's setup: Rampart Farm and Wool Mill, Circle R Livestock, Twin Oaks Farm, Lickety Spit Fibre Farm, All Sorts Acres, The Alpaca Stop at Stone Spindle Farm, The Common Good, Freelton Fibre Mill, Linc Farm with Canadian Comfort Alpacas and On the Brink Alpacas. This won't be the last Landmade. Discussions are under way as to when to arrange the next one. In the meantime, all of these farms and makers and people can be reached via the UCFS (www.uppercanadafibreshed.ca) or facebook. Yesterday we held our first "Landmade", in partnership with the Upper Canada Fibreshed. This was an event where 9 farms (including ours) setup tables at the Gladstone Hotel and trucked in fleeces, roving, yarn, batts, felt and skins... any kind of raw material that a knitter / crocheter / spinner /weaver / felter might want. It was an opportunity for the farms to shine - for the farmers (who were all women yesterday) to be able to show off the fibre that we all work so hard to produce. Even though the UCFS has members who are makers (including Canadian Ewe who also produces lovely yarn), I had always conceived of this event as one where all of the vendors started on equal footing: the farm. We farms go to events to sell our products and we are often part of a crowd that includes businesses (mills without livestock, wholesalers etc), and makers who purchase the raw materials for their products. I have always felt that the reality (and the voice) of the farms can't be heard within the variety of the crowd. So I wanted to give these women the opportunity to proudly show off their prize fleeces and their handspun yarn that was created from the fleece of a favourite ewe or alpaca. To lay out the roving that was blended based on her judgement of which of her animals would spin well together. To display the milled yarn that reflects the consideration and imagination she gave to the fineness of various fleeces long before shearing even happened. When fibre farmers are amongst their flocks / herds, we don't just see the animal. We see the future fibre that will be sheared at some point by a shearer who understands the value in that fleece. We consider the nutrition that goes into supporting the growth of exceptional fibre. We dream of the results that careful breeding can bring in expressing lovely fineness and structure of fibre. When a fibre farmer is in amongst her herd / flock, she can't help but touch the fleeces to judge the softness, the consistency, length. We look at our animals and dream of yarn. So Landmade was an opportunity to share that belief and commitment and enthusiasm. The roving that our spinners and felters buy and the yarn that our knitters, crocheters and weavers take home represents the responsibility and hard work that goes into being a fibre farmer. It all reflects long hours in the barn during lambing, days of hay moving and poo shovelling. It reflects harsh realities and gentle, quiet moments. It is a relentless struggle and a constant joy. So when you buy the fibre and hear the story of this ewe or that alpaca, you can touch the relationship to the land and the living creature that produced this amazing product, first hand. It's pretty hard to post updates when (farm) life gets in the way. We had an awesome crop of sprightly lambs this year, and 2 new cria. The drought made the summer a challenge - not just because the hay crop was so dismal, but because all of the critters need so much water in the hot weather. Thankfully the barn has access to a cistern, so it relieved some of the pressure on the well. We've joined the Upper Canada Fibreshed, and we're thrilled to be meeting like-minded producers who care about ethical fibre and sustainable husbandry. We are also big fans of The Wool Study, led by Nicole Klenk (also of the Upper Canada Fibreshed). It seems that there is more interest in natural fibres (and all the reasons to use them) and so more people are reaching out to learn about and experiment with yarns and rovings. It seems, too, that there is increased interest in spinning and weaving, which is the backbone of the natural fibre movement. We are grateful every time we go to an event and people seek us out with questions about what we do and why it matters. We had other amazing things happen on the farm. We re-homed a horse from The Equestrian Association for the Disabled - Mikey. After a bit of an adjustment for him and for the sheep and alpacas (what is that thing?? from both camps) he's become a comforting, reliable presence in the field. He and Dixie, the LGD, spent most summer nights together in the paddock. Our swan pair hatched a cygnet this fall. Both the female and the male sit on the nest, and both have turned out to be wonderful, protective parents. It's been exciting to she him/her grow! All of this is to say that we've been busy and so the blog has suffered. But we have some wonderful yarns and cheerful animals to show for our hectic schedule. We appreciate it every time you check back. We had two babies this fall - both boys. Patron (of my heart) and Mudslide have both been doing well, and their first-time mms have been terrific! We bred 3 girls this summer, so hopefully next summer will bring some girls. We've been breeding the sheep for the past few weeks. Our Romney ram is taking his job very seriously and has been wooing his gals (the Romney ewes as well as the North Country Cheviots). Jed has his 5 Icelandic girls living with him but they don't seem convinced that having a male living with them is something they're interested in doing long-term. The garlic is in, although if this warm stretch continues I might try to throw a few more rows in. It's been an unusually warm November - it's the 17th today and it is still in the low teens. They have been saying it might be a warm winter. Of course we need the freeze/thaw but my heart doesn't mind the sound of a winter where the temperatures didn't sit at -40 for 2 months. It is so hard to keep the water open for the animals. We've had a predator visiting the pond, and so we've put the swans and ducks away in their winter hut. We think it's an owl that has been the problem. The water birds aren't crazy about being inside when it is so warm out, but until the owl moves on, at least they are safe. It feels like we can never win the battle against predators. Soon the snow will come, but the weather has made it possible to keep checking off the to-do list and not freeze while we do it. We are thankful. Super gear up for summer! Another hard winter has passed and I can't even think of where the time has gone. But here we are and it's finally warming up (although it's been to wet and cold to get into the garden yet) and we've been able to get the crias out on grass at least..... in the backyard, but at least it's something. 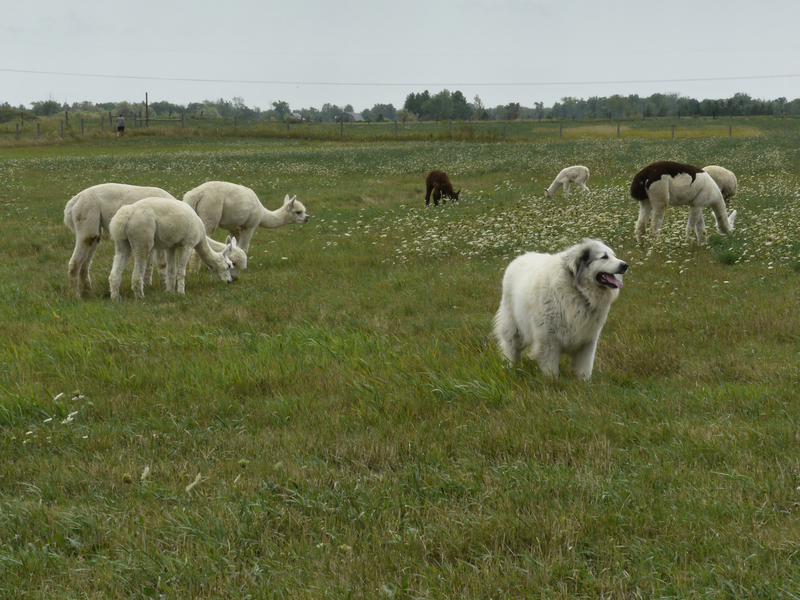 We have a new little girl added to our herd - Silk'n'Diamond, from Canadian Comfort Alpacas. She has a lovely temperament and the babies seem to find her calming... she's not much older than them, but she is bigger and laid back, so we put her out with Charlie and Nugget in the backyard and they settle right down. We've had to keep little Rudy away from the bigger youngsters - his back has been injured some how and Dr. Sherry has put him on strict play-free quiet time for at least 3 weeks. We've paired him up with Phoenix, who is as quiet as Rudy is, and they've been separated from the other babies. Without the rough-housing that Charlie enjoys, Rudy's back is getting better slowly. There is a lot to do these days... the garden, repairing fencing, overseeding the hay field and getting ready for the markets. Michele is doing lovely work with our felted soaps, and has also been working on some designs for our laundry balls. We're hoping our Felt-Your-Own-Soap kits provide our customers with as much soap-felting fun as we have when we're felting. We're now offering vegan kits as well as our goat's milk ones. Spring is always the season with the most hope and expectation.... Happy planting! After months of carting our bins around to the Farmer's Market and any number of craft shows, we've set up tiny area in the office of Michele's boarding kennel as a permanent "store". It's been convenient for people who want to drop in to replenish their soap supply, and we've been adding to the rest of our product line as well. The long-term plan would be to have a bigger, off-the-grid building, but for now this has been a great step. The continuing mild weather has helped us tremendously... we've gotten more fencing put up and we're almost finished a new run-in for the older boys. Christmas was fun for all - the kids got clothes and the animals got toe trimming! We will all of our friends and supporters a very Merry Christmas, a Happy Hanukkah, and all the very best for 2015. Our first craft show season! We have been vendors at a number of local shows, learning the ropes and meeting amazing people. We usually find the vendors helpful and friendly - we loved our Farmer's Market family. Our last show was last weekend so now we can finish getting ready for winter. The older boys' new run-in is almost finished and we've decided to put a secure door on it so they can overnight there if need be. We've had coyotes coming around again, so we've been locking all the animals up in the barn - it will be nice to more options for them. We have plans to reinforce the gate to the little boys' barn, and then the girls can take over the big barn again. We've also been experimenting with UPCYCLED DRYER BALLS, in addition to our wool ones. The patterns that the blankets and sweaters come in make the balls all unique. Soon we'll be opening up our store page, and the dryer balls will be available along with our soaps, socks, and other fun things!